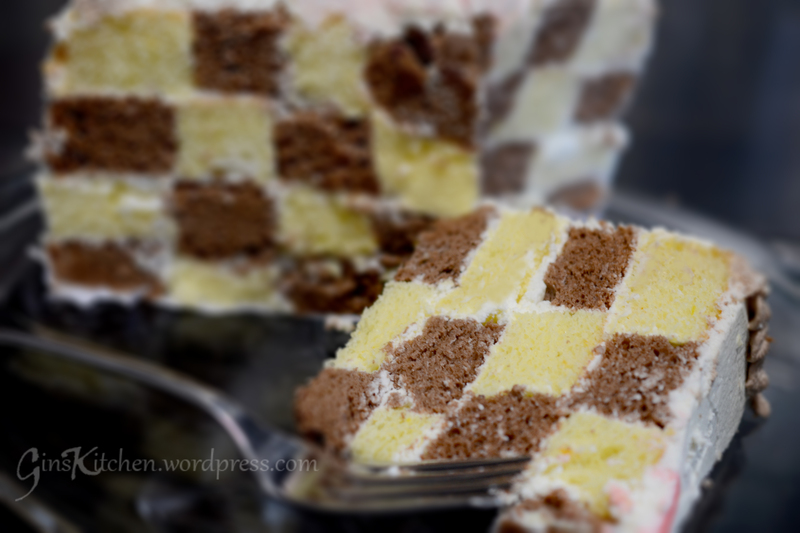 I baked a checkerboard cake for my husband’s birthday. Since he loves chiffon cakes, I thought putting two flavors in one cake would be a good idea. The first time I made this cake, the chocolate flavor overpowered the orange flavor and both cakes did not rise too much (I used a recipe for an 8″ cake but divided half of the ingredients for the orange cake and half for the chocolate cake). I also realized putting two cakes in the oven at the same time had also cause the cakes to not rise properly. So I made some adjustments – (1) increased orange zest to 2 tbsps to enhance the orange flavor, (2) bake a full size cake for each flavor, and (3) bake one cake at a time. This time the cakes came out beautifully. 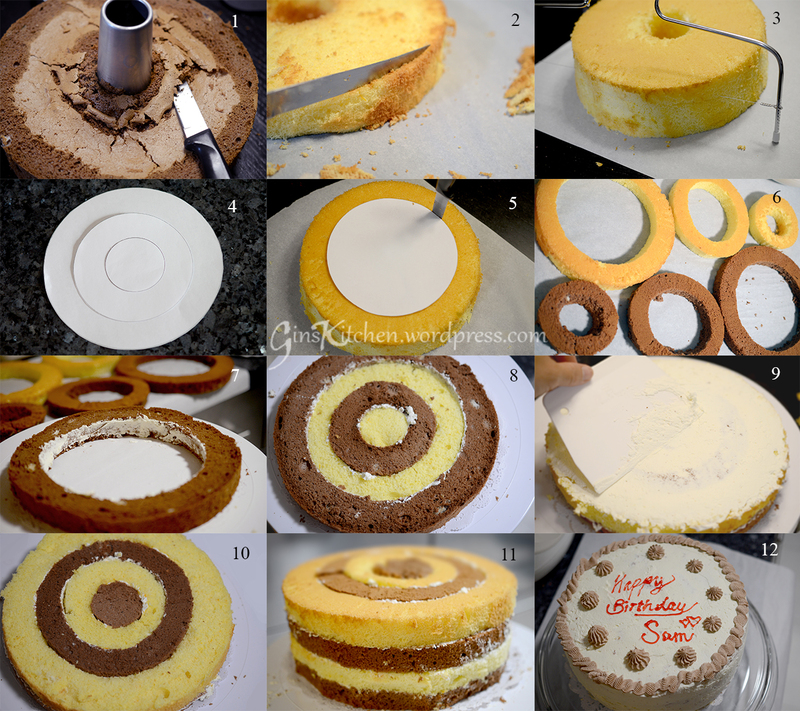 Directions for making the Orange Chiffon Cake, please click here. Preheat oven to 340 °F. Mix egg yolks and 35 g sugar until well combined. Add in olive oil, milk and vanilla extract, mix well. In a separate bowl, combine flour, baking powder, salt and cocoa powder. Sift in cocoa powder and flour mixture into the egg yolk mixture, mix well to make sure there are no lumps. Set aside. Beat the egg whites with an electric mixer until stiff peaks form. It is best to begin at a slow speed and gradually move up to high when beating. Add cream of tartar to stablize the egg whites. After mixing well, add 70 g of sugar in three batches, about one-third at a time, and beat well between additions. Continue to beat until the egg whites are stiff and glossy. Don’t over beat it, overbeaten whites look lumpy and watery. Gently fold-in half of the egg white mixture into the egg yolk mixture and repeat the same with the remaining egg whites. Pour mixture into an 8″ tube pan and bake in the preheated oven for about 40-45 minutes. Remove the cake from the oven and invert the pan immediately. Let cake cool completely. Remove the cake by running a thin-bladed knife around the pan, angling the knife towards the pan to try to get the full crust on the cake. Before assembling the cake, place both cakes in the refrigerator to chill so they will be much easier to cut into circles. I used a cake leveler so they will all be even. Bear in mind this is a chiffon cake, unlike the regular buttery checkerboard cake, it is harder to cut through as the cake is super soft and fluffy. Also trim off the edges with a knife (picture 2). Now assemble the second layer which will have the opposite colors (orange flavor first). (picture 10) Repeat Step 10. To decorate the cake, apply frosting all over the cake. (picture 12) The whipping cream frosting recipe is below. Whip the heaving cream with medium speed until it’s smooth and firm, add powder sugar and whip for another 1-2 minutes. To make the cream more firm, add Vanilla Instant Pudding and whip for 1-2 minutes. The tube pan has a hole in the middle. I saved some batter and poured into a 3″ springform pan and bake separately (do this for both flavors). These small cakes are used to fill the middle part of the checkerboard cake. Hi, this is such a beautiful cake, I am really thinking of making it too. May I ask the size of the eggs you used for this cake? 6 eggs for each cake seems a lot. Thank you for visiting my blog. Yes, there are 6 eggs in each cake. The chocolate cake usually won’t rise as high as the white cake. I was able to cut 3 layers of the white cake, but only 2 layers of the chocolate cake. In my picture, I did not use that extra layer of white cake. Egg size is regular, not the extra large eggs. If you want to make a little adjustment, you can reduce the egg yolk to 5. The cake still will come out very nice.